If you are worried about opening your shoes in company of people or during a pool party, it is time to take a step to prevent those stinking feet. Generally, this happens when you sweat too much from your feet. Sweat combined with the bacteria can cause really bad stink which is a real turn off for people around you or when you want to knock off the shoes and relax with someone at the end of the day. To prevent all this, spray your feet generously with antiperspirant deodorant for men or women. This will reduce sweat as well as stink. However, you must consult a doctor to ensure there isn’t any underlying problem which is causing this such as a skin infection. There are times when you are not in the mood of washing your hair or getting too late for the party or meeting and do not have time for doing your hair. Under these circumstances, get rid of that oily slicked stinky hair by spraying on deodorant for women around your scalp. The talc present in the deodorant spray will work similar to a dry shampoo absorbing all the oil giving you fresher looking hair. Make sure to choose a pleasant scent for this instead of those woody or spicy ones. Mistakenly used that permanent marker on a white board or any other surface? Do have stains of permanent markers on clothes? Use your aerosol deodorant, spray on the surface and wipe off with a tissue paper. If you are trying to remove stain from the cloth, add a tissue paper underneath and spray with deodorant letting the tissue absorb it. Once it is dissolved, wash the cloth with detergent. Isn’t it re-mark-able? Carrying a perfume everywhere is not possible but when you need fragrance for the rest of the day, deodorant is your saviour. Choose a spray, which is similar to your perfume, or have similar notes. Spray on your perfume to layer it and the scent will last for all day long. Layering helps in enhancing the scent’s sillage as well as longevity. 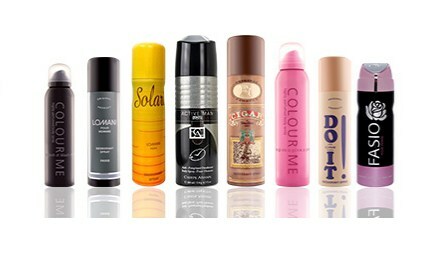 Deodorant can help you a lot in various ways, you just have to discover all the various ways. Look for the ingredients present in the Deodorants and utilise it.